SFW123DUB Combination Fire/Water Safe is rated 4.3 out of 5 by 36. With dual combination and key locking, solid steel construction and a pry-resistant hinge bar, the SFW123DUB is ideal for the protection of your important documents, digital media and other valuables. Complete with fire and flood protection, this safe is ideal for all your home or office security needs. Rated 4 out of 5 by kabong in Arizona from Good all around safe for the price. Handle should be made of metal instead of plastic. It raises concern over possibility of breakage as the safe ages. Plastic handle cheapens the product. Rated 5 out of 5 by Art6x7 from Very Well Made After hemming and hawing and looking at hundreds of safes, I got the SFW123DUB for it's fire and water protection. I needed a place for important papers and my dad's old camera. Also, I could just go down to Lowe's and pick one up. I was worried about the mechanical combination lock. Reviewers for some safes had trouble with this type of lock, but so far after 6-7 openings it has worked perfectly, opening first time every time. I see why people complain about the plastic handle, but for the size of this safe it's more than adequate. I was also worried about the price. I'm a subscriber to the adage, "Ya get what ya pay for". This safe seemed too inexpensive. Don't know how they do it for that price, but this safe seems like a solid, well made piece of work. All in all it's what I wanted and then some. 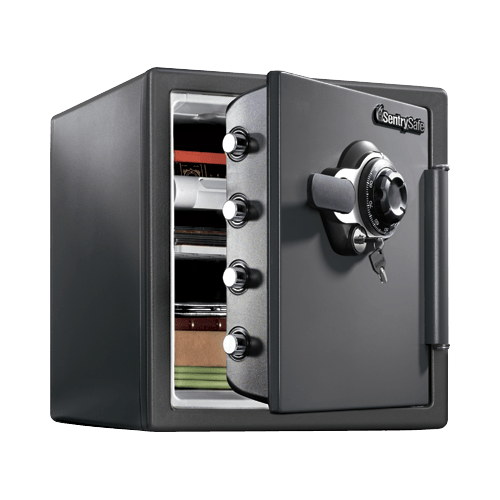 Rated 4 out of 5 by jv78132 from Strong, Secure, and Affordable This safe is secure and spacious enough for my needs. The safe is well constructed. My only critique is the construction materials used for the handle and the combination dial. Although they work well overall, these particular parts of the safe feel more like plastic and not metal. I have not had any issues, but would have preferred all materials used in the construction were metal or a sturdier material than plastic. Rated 4 out of 5 by Lance W from Well Built safe I love the size, design and functionality of the safe. My only issue is that the handle and rotary combination of the safe is made of cheap plastic and can be easily broken or compromised !!! 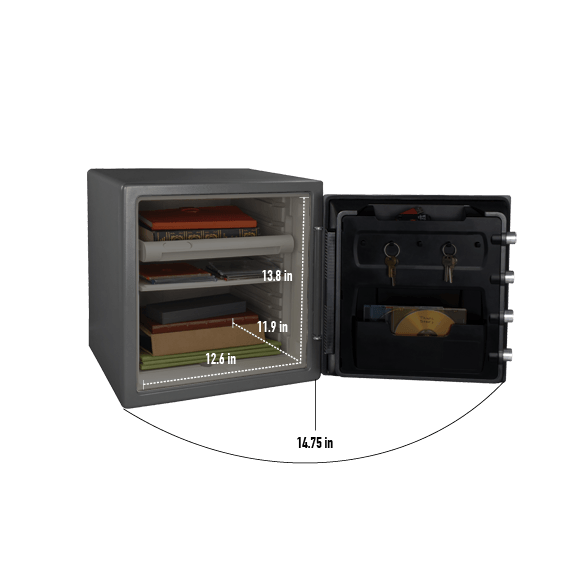 These components need to be constructed from a durable metal, you should also offer a metal kit to replace these plastic components for people who have already bought one of these safes. Rated 4 out of 5 by bob1948 from Excellent for our needs Like the safe. However, the ability to bolt into concrete needs to improve. The plastic inserts are not good. In addition, the bolts are too short when bolting down thru carpet into concrete. Should use concrete anchor bolts. Would also help to have a template to place between safe and floor in order to insure better alignment of holes to be drilled. Rated 4 out of 5 by M1tanker from Appears very secure Safe seems very solid and the only unknown is whether or not the plastic shelves will sag over time but that’s a minor issue. I like that you have to login to their website and give them the safe information in case you get locked out. I purchased an extended warranty at the store I bought it from but doubt I’ll need it. Rated 5 out of 5 by MikeL in PA from Perfect size for my needs This safe is exactly what I was looking for. It fits perfectly in an 18" base cabinet in my office which keeps it hidden. Plus I wanted a fire and water resistant safe. It's a perfect size to hold my documents and cash, which helped clear out stuff from my gun safe. Rated 5 out of 5 by jbrownie7 from Above and Beyond Expectations This safe is a great size, very sturdy and durable. I am impressed by how much space there is, how easy it is to open, and the quality of the safe. I definitely recommend this safe and with the lifetime warranty, it’s a no brainer.